** Note ** Airguns are legal, to be sold, bought and transported (on your trunk, not loaded) in Mexico. About: Born in 2006, they distribute and resell airgun and airsoft gear, pistols, rifles and more. It is for free / Shipping has cost and have urgent orders and a higher cost. + Pretty simple, easy to use basic “Joomla” kind of site. + Shipping to your door. – Content is not always precise, titles, name of products, FPS of the gun, etc. so just double check before you buy. – Customer service / support is not good, you will be frustrated if you need a lot of personal assistance. – Informal way of dealing with orders and giving customer service. -Pretty basic functionality on site, but has what you need to shop. Content is not well captured and might sometimes be incorrect, so verify in other sites before you make a purchase. They are not careful capturing information, photos. 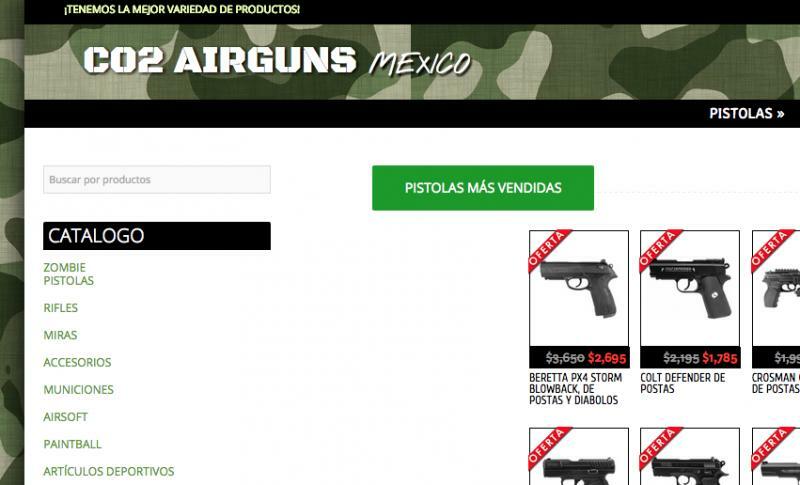 Conclusion: If you want an airgun, airsoft or common accessories for personal defense, shipped to your home in Mexico, this is a good site to do it. Even though they are a micro informal company, we’ve tested it several times and all shipments were successfully sent as requested. You will pay a high price if you compare it with buying it in Amazon, but the product is already in Mexico, so its a plus.